At a dinner party in 1945, famed architect Ludwig Mies van der Rohe was approached with an offer. Prominent Chicago nephrologist Dr. Edith Farnsworth wanted Mies to create a weekend getaway along the Fox River in Plano, Illinois. The offer was for Mies to design the house as if it were for himself. 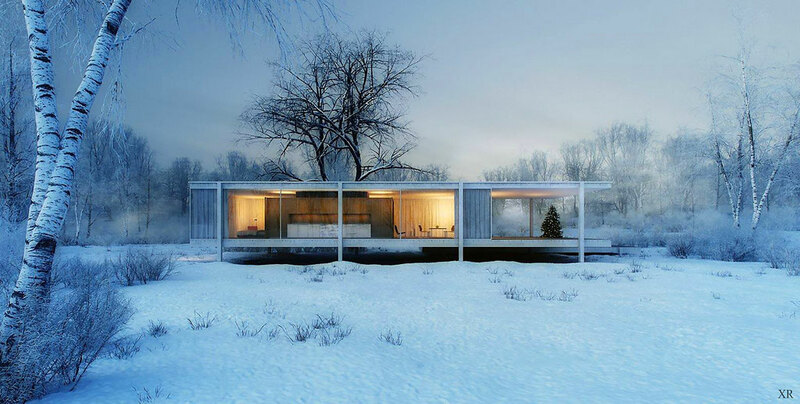 The result was the culmination of the unique take on modernist architecture for which Mies became an icon. With the launch of a new 3Doodler Create themed kit for the Farnsworth House, we take a look at the inspiration and architectural movement behind this stunning example of modernism. While many modernist architects believed architecture should be used to socially engineer human behavior and guide occupants to higher ideals, Mies used his buildings differently. His architecture still represented his ideals and aspirations, but instead of constructing in a way to carefully engineer a result, Mies instead focused on freedom of movement and use. With a minimal framework and expressed structural columns, his buildings offered and open space in which inhabitants could express their own spirit—something he saw as crucial to elevating the harmony between architecture and humanity. Mies often reflects the industrial culture he saw as growing in the United States within his own architectural aesthetic, and uses this to offer occupants a flexible and unobstructed space. His ultimate purpose was to join together natural elements with culture and construction. “We should attempt to bring nature, houses, and the human being to a higher unity,” Mies once said, and he reflected this ideal through designs featuring glass walls and few solid exterior walls. Constructed in a pastoral setting, the Farnsworth House is a clear culmination of the modernist ideals Mies sought to bring together in his designs. The singular geometric form of the house is simple in the extreme, constructed of steel and glass with a minimal form. The one-room rectangular structure sits parallel to the Fox River, with a perpendicular cross axis directly facing the river and nature. Elevated 5 feet and 3 inches above the ground, and with floor-to-ceiling glass as the outer walls, the Farnsworth House appears to be floating within the natural landscape around it. The glass walls encircle an open floor plan with a core wooden block containing the toilet and kitchen—a wooden room nesting inside the larger glass rectangle. Each area of the living space—areas for sleeping, eating, sitting, and cooking—is suggested by the arrangement, but ultimately the inhabitant is free to decide the use of space as they desire. To honor this National Historic Landmark and icon of modernist architecture, 3Doodler is pleased to present a unique Farnsworth House theme kit for 3Doodler Create. In collaboration with the National Trust for Historic Preservation, the Licensed Project Kit includes detailed stencils created from the original Farnsworth floor plans, so anyone can create this modernist masterpiece in miniature scale. The kit also includes a visual step-by-step guide and four packs of ABS plastic to replicate the original structure. Learn more about the the making of this kit here.